2274 WIEST,Friedrich Nov 1851 Russia 1913 Wishek, N.D.
2287 WIEST,Edward Abt 1897 Rohrbach 2 Nov 1987 Hennepin Co., Mi. Built by A/G Vulcan Shipyard, Stettin, Germany, 1906. 19,360 gross tons; 707 (bp) feet long; 72 feet wide. Steam quadruple expansion engines, twin screw. Service speed 23 knots. 1,970 passengers (558 first class, 338 second class, 1,074 third class). Built for North German Lloyd, German flag, in 1906 and renamed Kronprinzessin Cecilie. Bremerhaven-New York service. Seized by United States Government, American flag, in 1917 and renamed Uss Mount Vernon. Laid up 1919-40. Scrapped at Baltimore in 1940. 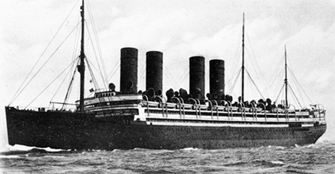 The fifth and last of the German four-stackers, Kronprinzessin Cecile was built by Vulkan of Stettin, as were all four of her predecessors. Launched in 1906, she made her Bremerhaven-New York maiden voyage on 6 August 1907. Her commercial career ended when World War I began seven years later. At sea on 31 July, only 900 miles from reaching Plymouth, Kronprinzessin Cecile was ordered to return to the United States with her 1,216 passengers. (She was also carrying over $14 million in gold and silver destined to pay American industrial borrowings from British and French banks.) During the crossing, the tops of her buff funnels were painted black in an effort to disguise the ship as White Star's Olympic. She arrived at Bar Harbor, Maine, on 4 August and, after her passengers disembarked and the gold and silver were unloaded, she remained there for six weeks, guarded by a Coast Guard cutter and two destroyers. She was then escorted to Boston, where she was interned until the United States entered the war in 1917. Taken over and converted into an armed troopship, Kronprinzessin Cecile became the USS Mount Vernon and made her first troop-carrying departure from Hoboken, New Jersey, on 31 October 1914. Initially painted gray, Mount Vernon was repainted in a blue, gray, black and white dazzle design in 1918. She survived a direct hit from a torpedo launched by U82 in September 1918, but 34 of her furnace room crew were killed. After temporary repairs at Brest, France, and a complete overhaul of her damaged boiler rooms at Boston, Mount Vernon returned to service in February 1919. Her last ocean crossing came in the fall of that year, when she was sent across the Pacific to Vladivostok to evacuate refugees and foreign troops trapped there after fleeing the Russian civil war. On her return, Mount Vernon was transferred to the United States Shipping Board and laid up in the Patuxent River. Various plans to return her to commercial use came to naught, and she was ultimately scrapped in Baltimore in 1940.